There were two constraints governing this ride, one leading from the other. Due to the almost irresistible attraction of the HOG Rally at St Tropez, C&F’s premier event of 2017, I was restricted to the valuable services of only one road captain, Mick Newstead. This meant that I wasn’t going to risk a fuel stop, so mileage was restricted to the smallest tank range of the bikes attending - say 60 miles. The actual route was dreamed up when I was in Berlin on a city break in April with No 2 son Simon (ex-Sportster rider and Gold Rocker holder). Since Warr’s at Kings Road was not expected to be open at all (confirmed by JW himself in Early may) why not make a feature of breakfast, and then go for a leisurely tour of West London and Surrey, ending up at that Biker’s mecca, Ryka’s at Box Hill? If only Harley made a café racer! A quick look at the road atlas soon came up with a circuitous 50-mile route, some of which was more picturesque than other parts. I’m afraid Greenford seems to be beyond redemption. The other constraint was mostly self-inflicted - I wasn’t going to use the A3. I allowed the route to cross it, but not to travel along it. You may be aware that the usual minimum number of road captains for a ride is three - but by keeping mostly to a route with urban speed limits and no high-speed roads, I was allowed a dispensation to only have two, provided I could find a couple of sensible and experienced C&F members to help out. Big thanks to Nigel Gaskin as ‘extra last man’ and Jean ‘who-needs-baffles-anyway’ Dignand as general help and chief booker in. The whizzy booking-in swipey thing was in St Trop so we were back to paper. A quick email to the Ace Café had indicated that we would be welcome for breakfast, even though it was a BMW day. Clearly I had also booked some excellent weather. On arrival at Warr’s I was surprised to find that the shop was open, but it was a for a photo shoot so we kept out of their way. Good to see ex-workshop boss Martin Slagowski looking fit and well. 41 riders and pillions booked in and after a preliminary briefing it was off to the Ace. Breakfast al fresco in the May sunshine was indeed fine. Once everyone had eaten and drunk we had briefing #2 as no-one would remember the first one by then. I must say that everyone must have listened as there were no missed drop-offs and the bit about going the ‘wrong way’ around Richmond Park caused no issues. I did ask people to keep the decibels down in the park so as not to upset the deer. The park was crammed so it took an age to navigate the 5 odd miles from Star and Garter Hill to Kingston Gate. At this point I took the decision to shorten the route, as it was taking far longer than the recce; rather than going via Kingston and Hampton Court, it was through New and Old Malden and West Ewell to pick up the A243 past the Star pub down to the A24 for Ryka’s and Box Hill. I took the opportunity for a quick regroup in Old Malden in case the last man was suffering from advanced bafflement as to why we weren’t following the route, but the group came together within 5 minutes so all was well. On arrival at Ryka’s the official ride ended and it was up to people to take their choice of refreshments and make their own way home. That was about the 150th ride I have done with Chelsea & Fulham, stretching back to early 2001, and it goes to prove that lots of fun can be had at low speeds and over short distances - it all depends upon the quality of the company (and the motorcycle). Big thanks to Mick, Nigel and Jean for helping out. Sorry about the torrential thunderstorm that struck at 3pm. 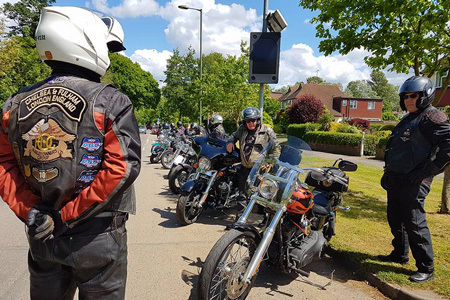 Next ride-out is 11th June, where Fred promises to take the membership ‘back in time’. Keep an eye on the web-page or Facebook to get the all-important start times. After all, who wants to be the wrong side of a closing gate?